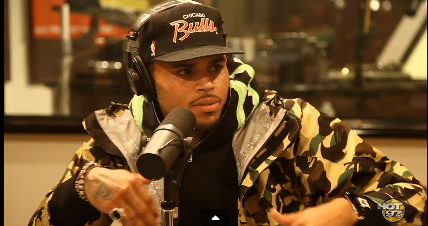 After previously appearing on E-Bro in the morning, Chris Brown made a brief visit to Funkmaster Flex for a brief sit-down. Their conversation touched on the current Tyga and Drake rift calling out his current YMCMB members and how both sides need to quickly resolve soon. Over the weekend, Drake Instagram’d a picture of Kylie Jenner – who had been rumored to be linked to Tyga and stirred up some controversy through social media. That prompted the L.A. rapper to respond t a few hours later on twitter saying “That’s not my hoe.”While the two have not directly said anything to each other, the elephant in the room was discussed during the interview where Breezy remained neutral saying he had love for all parties involved, but did cite his bond was closer to T-Raw. If you were like us, you expected to hear a Chris Brown verse on Nicki Minaj’s new “Only” singe. Unfortunately, Breezy was just limited to chorus duties in comparison to having 16’s like his comrades Tunechi and Drake, but Flex threw on the beat for fans to get their lost verse fix in the brief freestyle above.